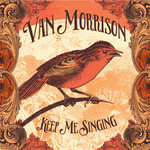 Keep Me Singing is Van Morrison's 36th studio album to date and consists of 13 tracks - 12 original songs written and performed by Morrison, as well as a cover of the blues standard 'Share Your Love With Me' - written by Alfred Baggs and Don Robey and previously recorded by artists such as Aretha Franklin and Kenny Rogers. For the track 'Every Time I See A River', Morrison has collaborated with acclaimed lyricist Don Black. The album's closing track, 'Caledonia Swing', is an instrumental featuring Van on piano and saxophone. All tracks were produced by Van Morrison.